Rolled oats or simply oats are a healthy and easy breakfast option. They are very low in calories and are heart protective. I have used Quaker oats which give excellent results. Oats upma is an almost instant food. Peanuts and cashew nuts are totally optional. 1. Dry roast oats in a pan till their whiteness disappears and they look brownish. Take them out of the pan. 2. Heat oil in the same pan and add peanuts and cashews. Roast them for a minute. Add onion and sauté for 1 minute. 3. Add ginger and garlic and sauté for few seconds. Add water, red chilli powder and salt and cover the lid of the pan. Let 1 boil come. 4. Add oats and mix well. Lower heat and simmer covered till all water gets absorbed. 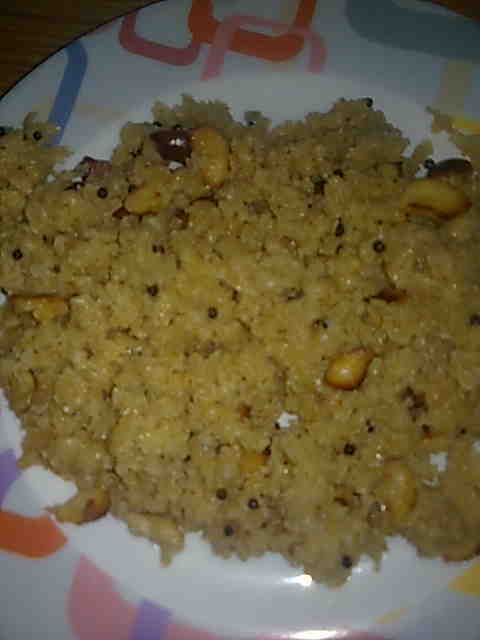 Turn off heat and serve oats upma hot. Healthy Bytes- Oats are a rich source of fiber, Iron, Thiamin and antioxidants.